As I’m wrapping up our bathroom makeover for the One Room Challenge (the full reveal is coming this Thursday! ), I’ve been busy adding the finishing touches to the room. We live in a small house with only one small bathroom, so it sees a lot of use and I want to be sure it’s functional for everyday use but that it’s also ready for company. 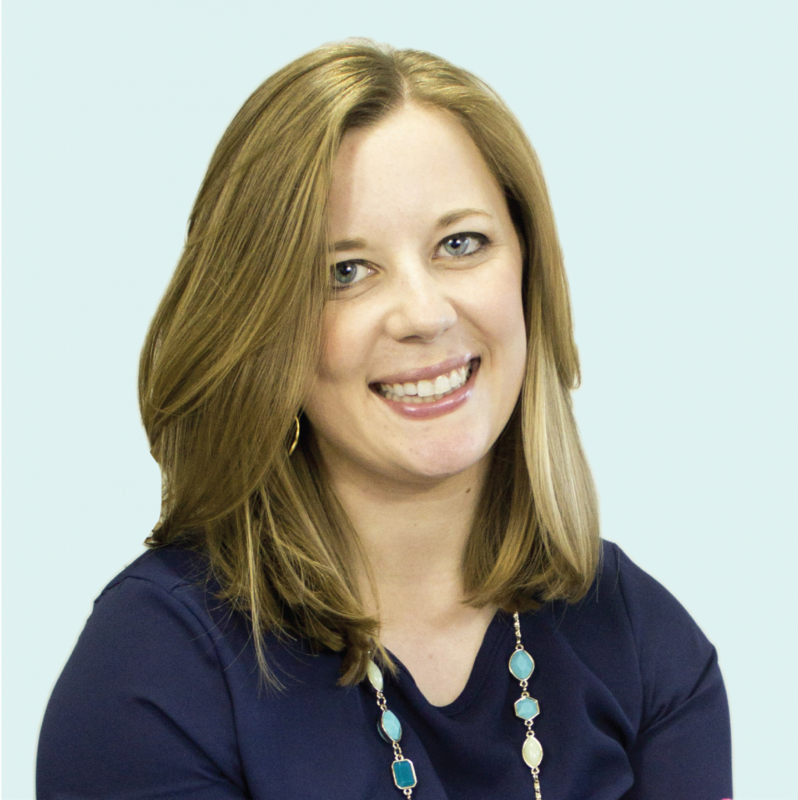 Since creating a guest ready bathroom is on my mind, I thought I’d share some tips with you today. 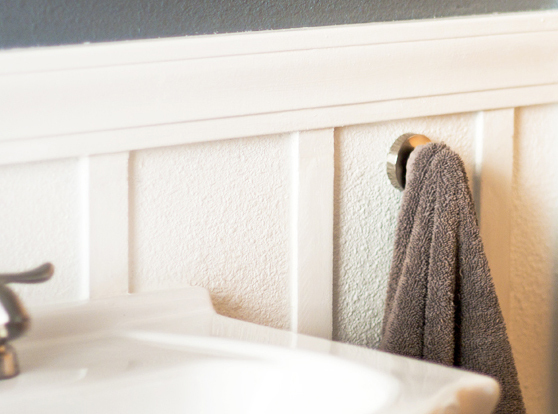 I’m all about planning ahead, and a bit of focus on your guest bathroom now means one less task to worry about when you’re caught up in the holiday hubbub. 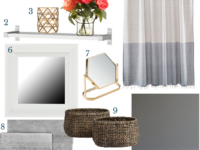 I know you want your home to be comfortable and put together for your guests this holiday season and the bathroom is key to making a good impression as a hostess. It’s so easy to get caught up in party preparations and totally space off the bathroom, so do yourself a favor and get your bathroom in order now. With holiday gatherings ahead, it’s smart to be thinking about creating a guest ready bathroom now so you don’t have to worry about it in the midst of preparing Thanksgiving dinner for your entire extended family or wrapping a gazillion gifts before the in-laws arrive on Christmas Eve. 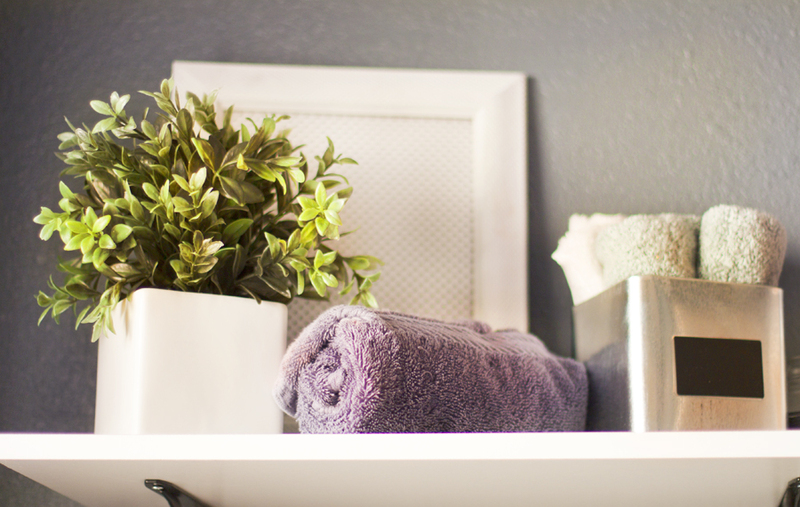 Here are six things I recommend doing to prep your bathroom for guests year-round, but especially leading up to the holiday season when you’re likely hosting more company than usual. I even created a mini checklist you may download at the end of this post and use to be sure you don’t forget anything! Cute checklists make every chore more fun! I keep basic bathroom cleaning supplies under the sink. That way they are easily accessible so I can wipe down the mirror, sink and toilet in a jiffy. In fact, I often do those things with one hand while holding my hairdryer with the other hand in the mornings. Also make sure to clean the toilet, wipe down the shower, sweep the floor, vacuum rugs and empty the trash before guests arrive. Hang a fresh, soft hand towel near the sink. This is a great time to bust out those holiday-themed towels you’ve been saving for a special occasion or the fluffiest towel you have…save the frayed towels for everyday use. If you are hosting a crowd, it may be a good idea to have a few extra hand towels available as well since the main one will likely become damp. If you have room, you can set a small basket of towels on the counter. Since I have a really small bathroom with virtually zero counter space, I try to have a supply of fresh hand towels ready in the closet so I can swap out the used towel for a clean one whenever I use the bathroom myself. 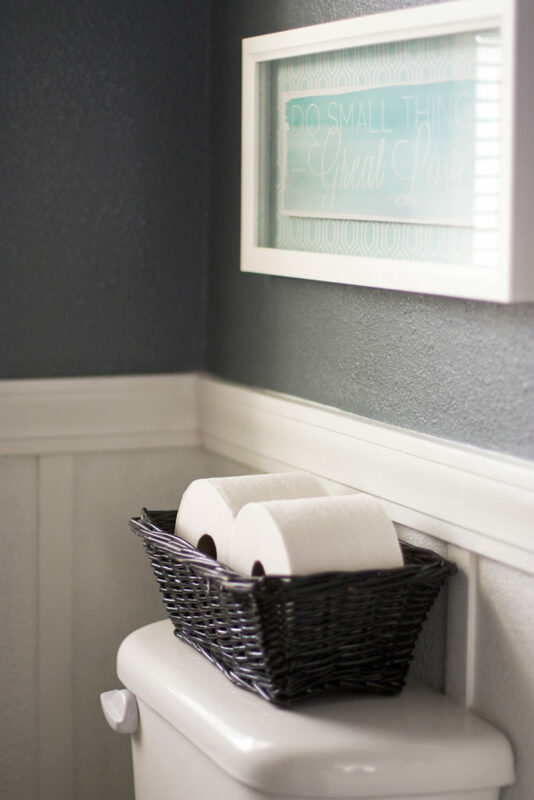 I did add a small shelf above the toilet during our bathroom makeover, and it gave me just enough room to display a small tin of washcloths and a rolled hand towel so guests can find them without digging through the closets. I much prefer liquid soap all the time, but it’s especially convenient when you are hosting company. If you normally use bar soap, switch it out for liquid while you are entertaining. Few guests will want to use a grimy bar of soap to wash their hands. Just think of all the people that will touch it! 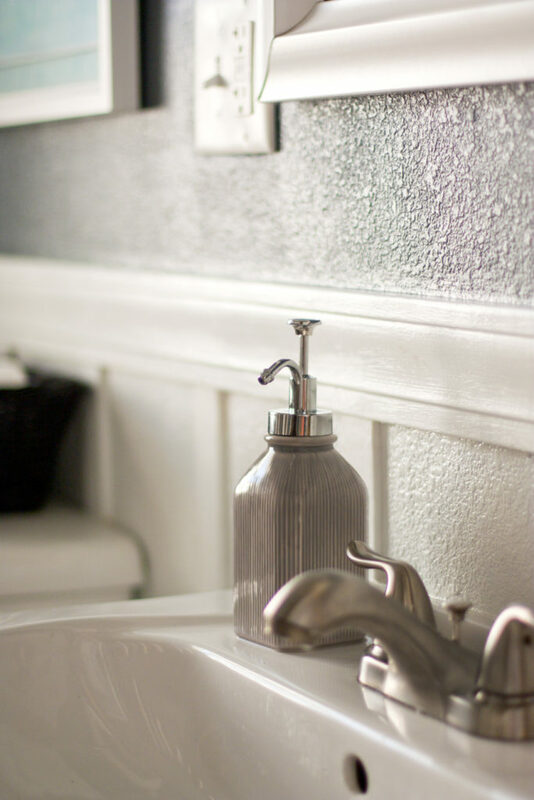 Find a decorative soap pump that you can set out next to the sink. I like to burn a mild-scented candle in the bathroom for a few hours before guests arrive so the room smells nice. Just be sure the scent isn’t overpowering in the small room since many people are sensitive to strong scents. It’s also a good idea to keep some type of air freshening spray under the sink so guests can find it if they, you know, want to freshen the place up after they’re done. Decorating Tip: I’ve recently become obsessed with the idea of wrapping string and yarn around vases (as I mentioned in my fall living room tour), and I tried the idea out on this plain white candle. Isn’t it cute?! I wrapped some embroidery floss around it and now it has a bit of texture and matches the decor. Easy peasy. Nothing is more awkward for a guest than running out of toilet paper! Have you ever been in that situation? It’s definitely not something you want to experience. Add a new roll to the holder and have a few extra rolls within reach. Guests will feel a lot more at ease when they see a couple spares sitting out at the ready. That way they know they won’t be left with the last single square of toilet paper on the roll. It’s good to be prepared! I found a small basket that fits perfectly on the back of the toilet and it holds two extra rolls. Decorating Tip: Did you know you can paint baskets? I spray painted this basket black to fit in with the rest of my decor. A small wire basket or wooden crate would also be really cute perched on top of the toilet with a few TP rolls inside. It’s also a good idea to stock up on toilet paper so you don’t find yourself running low during the holidays. I try to keep at least one full package stocked in our bathroom closet so I know I won’t run out anytime soon. 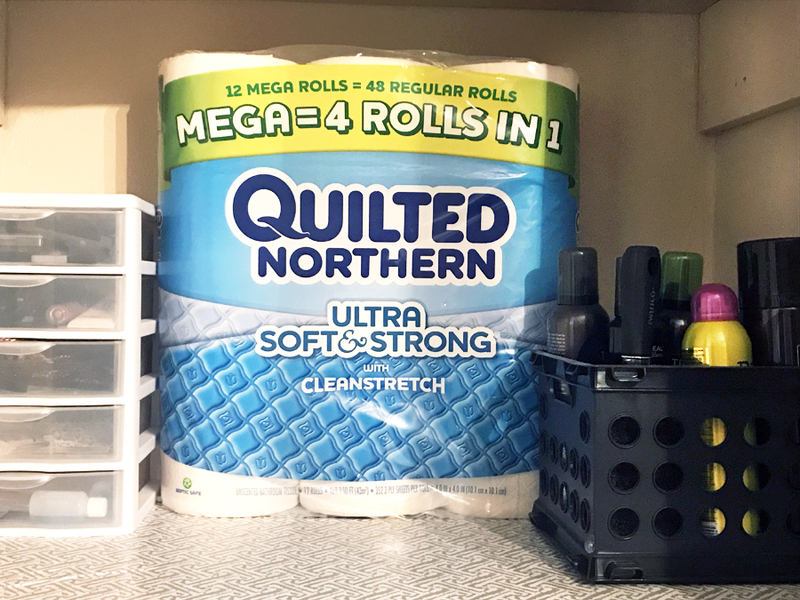 I like buying Quilted Northern Ultra Soft & Strong® Mega Rolls because the rolls last longer than your average roll, which means fewer refills. Heck yes! If you find yourself changing the roll all the time because no one else in your house seems capable of doing so, you’ll really appreciate the mega rolls. 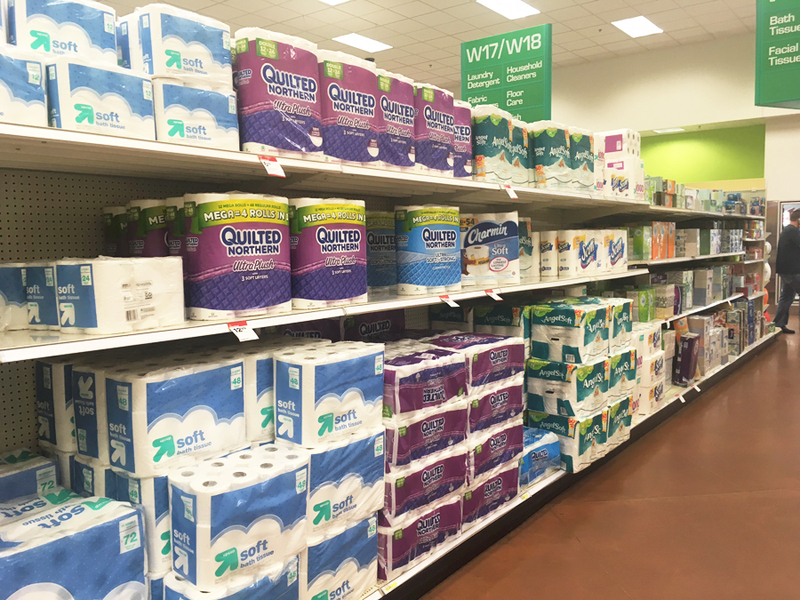 You can find Quilted Northern Ultra Soft & Strong Mega Rolls at Target in the bath tissue aisle. Use this Target Cartwheel offer (11/8/16 – 11/29/16) to save on your next purchase of Quilted Northern Ultra Soft & Strong Mega Rolls. And guess what?! 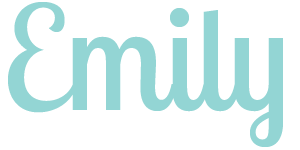 You can enter the sweepstakes at the end of this post for a chance to win Target gift card! Our bathroom is tiny, so there’s really not extra counter space to set out additional toiletries. I keep it simple and stick with a cute soap pump by the sink. But if you have room on the counter or an open shelf, a bottle of lotion, some tissues and a small basket of other basic toiletries would be a very nice touch. 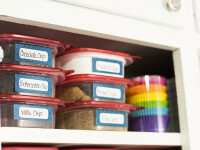 Having these basics out in the open means guests won’t have to go rummaging through your cabinets. We have a closed cabinet to the right of the sink, so I’ve decided to stash tissues and some lotion in there so guests will likely find them quickly if they do go rummaging (not ideal, but that’s how it goes in a small bathroom with zero counter space!). 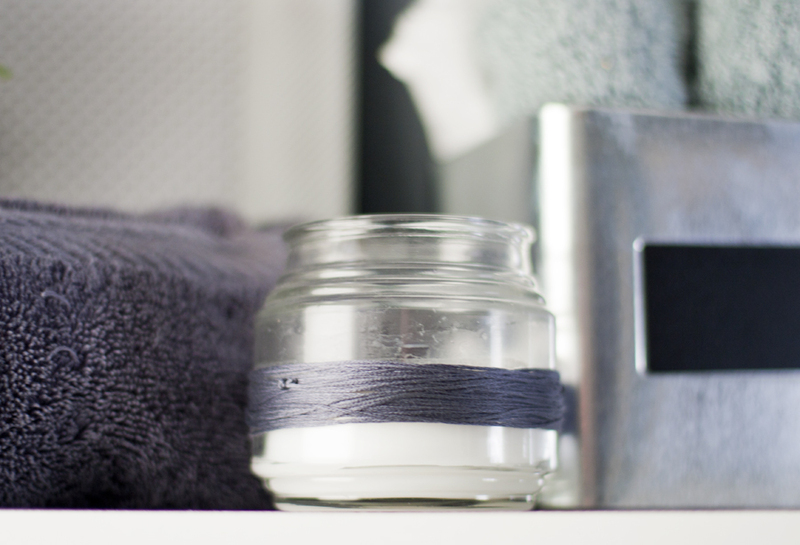 If your guests will be spending the night, it’s also nice to stock the shower with some essentials and set out a few of your best bath towels. 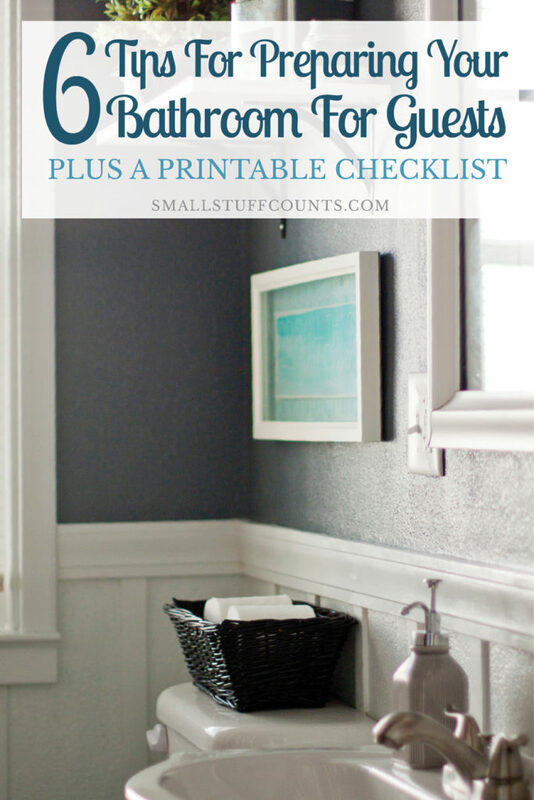 I created a simple printable checklist to tuck in the cleaning caddy under our bathroom sink. That way I remember to double check that all of the necessities are set out and the basic cleaning is complete when I’m double checking I have a guest ready bathroom. Click here to download the checklist for yourself. You can add it to your cleaning binder if you have one or simply tuck it in with your bathroom cleaning supplies like I do. 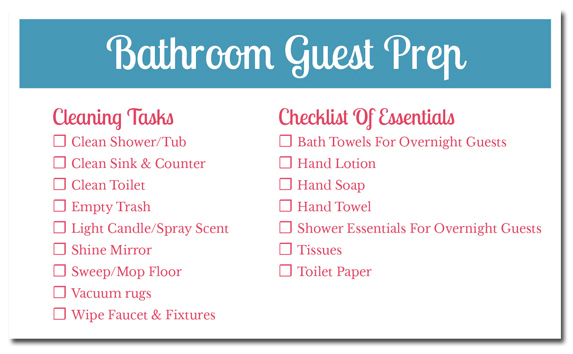 Good luck creating a guest ready bathroom in your home! Simple touches like these will make sure your bathroom is ready to impress. To find more Quilted Northern inspiration, check out the social hub here. You lucky ducks got a great peek at my newly decorated bathroom today, but be sure to visit again this Thursday to see the final reveal of our bathroom makeover as part of the One Room Challenge, where I’ve been working like crazy to make over our bland beige bathroom in five short weeks. Eek! I can’t wait to show you the entire room! The checklist is so handy I’m going to print it out and use it. Maybe even adapt it to other rooms so I have a checklist for the whole house. I love your tips. I also have a very small bathroom so this really helps. Thanks, Christina! I hope you find ways to maximize your small bathroom, too! Great ideas! I’m in the middle of redoing our half bath so this is perfect timing! I’m glad they’re helpful, Jenna! Good luck with your bathroom makeover! Great tips! I like the idea about leaving a scented candle in the bathroom and wrapping the string/yarn around it… it looks really nice! The checklist is really helpful also!! Thank you!! Thanks, Kim! I’ve started wrapping all sorts of jars/vases/candles in yarn and embroidery floss. I just think it looks super cute and is a really easy and inexpensive way to jazz them up. I’m glad you found the checklist helpful! Thanks for stopping by! Thank you for the helpful list! One thing I have always made sure to have on the counter next to the soap is lotion! It gets so dry during the winter months my guests really love having it available. Lotion is a wonderful thing to have on hand, Tammy! Great tip. I tend to use hand lotion all the time myself, so I know guests will appreciate it as well. Thanks for visiting! I always forget about the guest bathroom, thanks for the reminder! You’re welcome, Linda. It’s easy to overlook the guest bathroom when you’re busy getting the rest of the house ready. Thanks so much for visiting! Cristi, I’m so glad this list is helpful to you! It’s so easy to forget about all of those small things. Thanks so much for visiting!